On a magical stretch of beach along Florida’s Gulf Coast sits a beautiful pink castle, rising from the sand as if it were a mirage. Majestic ten-story stone walls of cotton candy pink with white trim stand tall above the white powder sand. Inviting beach cabanas lure guests to the waterfront to watch dolphins play, sailboats glide by and sunsets that are arguably the prettiest in the world. 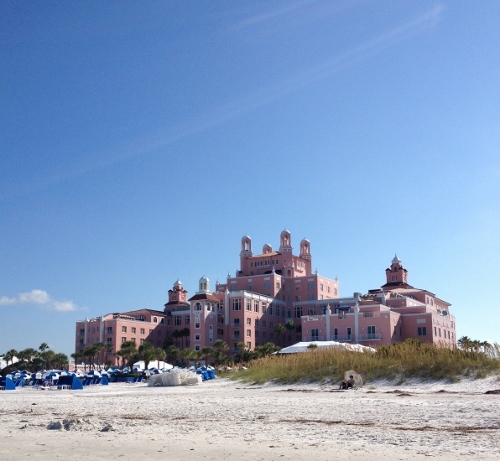 This glorious spot is the Don Cesar at St. Pete Beach. Opened in 1928, it has a storied past. That story intersects with my story. My father was stationed at the Don Cesar at the end of World War II. Like many grand resorts, the military made use of the building as a hospital during the war and after. 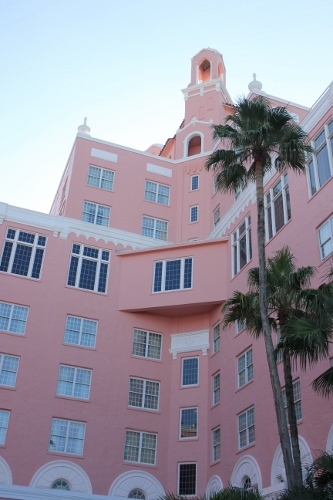 Eventually, the Don CeSar was abandoned and sat in disrepair for years. Around the time I was born, this majestic lady was renovated and re-opened. On family vacations, my dad would often take me to “The Don” as locals refer to it for an ice cream. Not one to talk much about his military service, dad didn’t share many tales of his time there but did always make a point to visit the beautiful historic building. My last visit there with dad was the day before my wedding in 1995. 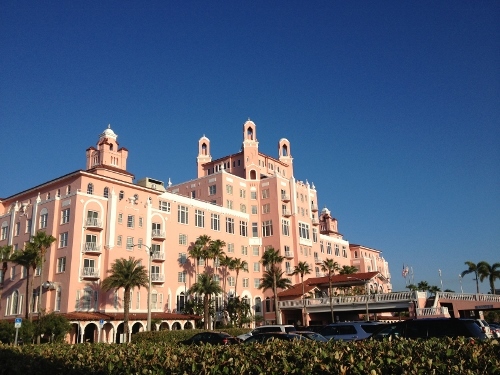 Now that dad has passed, the Don CeSar holds an even more special place in my heart and family history. 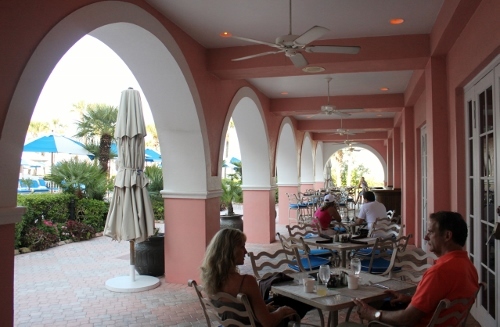 On my most recent visit to the Don CeSar, my sister who lives in Florida joined me and my favorite fella for breakfast at Sea Porch, an inviting, casual restaurant with both indoor and outdoor seating. While I love a sunset along this stretch of beach, mornings are special here. The beach is often aglow in pink reflected from the sunrise over the intercoastal waterway just a block away. It’s quiet, a few folks are out on a morning jog along the beach or thumbing through the newspaper at the outdoor tables of Sea Porch. I’m not typically an early riser, but I always get up with the sun when I’m here. It’s just not to be missed. 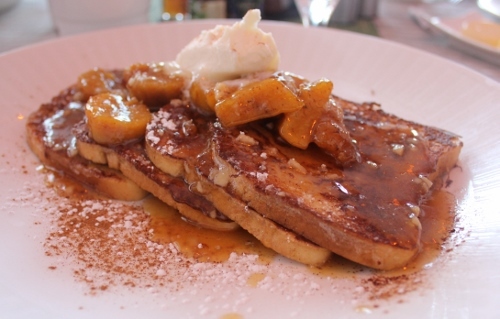 That would be Plantain Foster French Toast from the Sea Porch. Simply having the option of gluten-free French toast on Udi’s bread would have thrilled me. But this French Toast? I nearly cried when the last bite was greedily consumed. The plantains were tossed in a traditional Foster sauce, redolent of brown sugar and butter with a hint of rum, and topped with a dollop of mascarpone. I like French toast…but I LOVE this French toast. By far, the best breakfast out I’ve had since going gluten-free and perhaps one of the best I’ve had ever. For the remainder of my visit to this area, I had other breakfast commitments. Yet every morning I tried to finagle my way out of those commitments so I could enjoy this French toast again. The gluten-free goodness didn’t stop with the French toast. My sister had freshly baked gluten-free muffins. Baked in-house! She ordered a side of fruit which was a generous bowl of fresh fruit that dazzled the tastebuds of all of us at the table. I noticed on the menu the local farmers who have partnered with the restaurant are mentioned. No doubt we had a few local nibbles in that bowl of fruity goodness. Even though my schedule didn’t permit me to have the incredible French toast again, I did slip away for lunch at the Sea Porch another day. I rarely eat lunch out when I’m visiting this stretch of beach, opting instead for light nibbles and cold beverages in a beach cabana. But I knew I had to go back to Sea Porch to see if it was possible to have a lunch that rivaled breakfast. And it did. On the menu, a vegetable wrap caught my eye. I asked our server if it was possible to get it on gluten-free bread instead. Absolutely! Dining gluten-free is simple here and done so well. 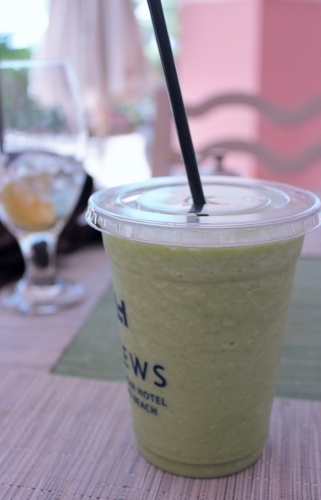 When we had breakfast at Sea Porch, I had noticed smoothies on the menu but did not have room for one with the generous serving of French toast. I asked our lunch server if it was possible to get a smoothie in the early afternoon. Again, absolutely. These folks made food wishes come true! I had a kale smoothie while walking along one of my favorite stretches of beach. I’m not going so far as to say I’m a kale snob, but I do make a pretty darned good smoothie and kale is almost always included. This smoothie? Better than any I’ve ever made. It hurts me a little to admit this…but I tell you this in hopes you’ll invite me along on your next vacation here so I can introduce you to the amazing food here. So about those sunsets I mentioned…I stop nearly every day, regardless of where I may be on the Earth, to witness the sunset. It’s my personal celebration of the day ending, of all of the joy the day contained and the hope that I get to do it again the next day. I have a large photo album on the coffee table full of sunset images I’ve captured all around the world. 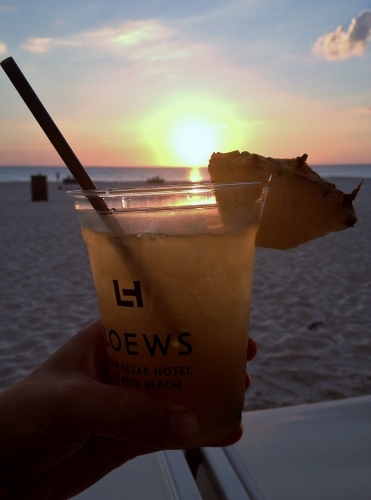 The best ones come from right here at the Don CeSar. They can only be made better when I put the camera down and pick up a cocktail from The Beachcomber Bar. Before I wrap up my culinary tales at the Don CeSar, I wanted to share a little bit with you about the service here. Exemplary, exceptional, personal. The morning we arrived for breakfast, we had a reservation. The hostess remembered my name from the reservation and used it to bid me farewell as we left. When I came back days later for lunch, she still remembered my name. I took a moment to tell her it appeared she enjoyed her job. She said she did indeed enjoy her job, she loved the company and meeting the guests. I recognized authentic passion in her eyes, it mirrors how I feel about my job. Then I noticed her greeting another family by name, too. Our breakfast server, while pouring coffee at an adjacent table, was wishing the family safe travels home. The gentleman at the table commented after she had left how surprised he was she remembered from a conversation earlier in the week what day they would be departing. The bartender who mixed my cocktail moments before the sun was setting commented to me that she has the best office view in the world. 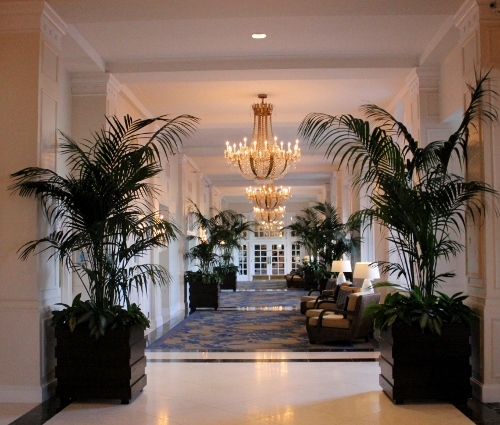 I agree with her and admire the work environment that has been created at the Don CeSar. I’ve been at many resorts and have witnessed staff that are abrupt, unhappy and seem to have forgotten to stop and enjoy the view. It was a joy to see happy staff and to see it reflected in the service they provide to guests. Every meal or drink I’ve had here left me feeling spoiled, pampered. 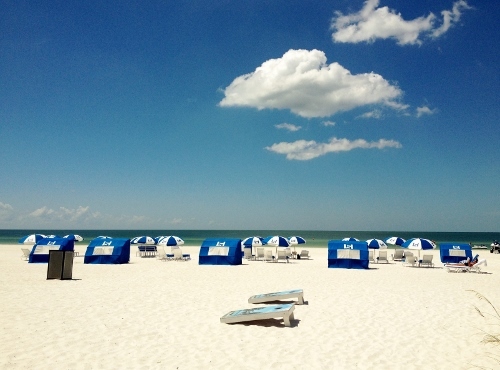 If one is going to enjoy this gorgeous stretch of beach, it should come with a bit of pampering. I do believe this is the best place for that to happen. Speaking of pampering, see that little blue canopy on the rooftop? That’s the spa at the Don CeSar. The moment I spotted that, I considered trading in my food writer career for spa writer. Surely there’s a need for writers who share beachfront spas! I’ve added a visit to their spa to my wishlist for our next visit. 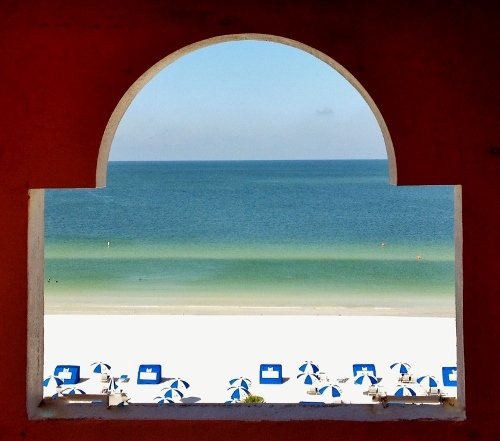 That photo, as well as the one below, was taken from the tower at the Don CeSar. It is worth the climb up multiple flights of stairs for the view. You can see for miles and miles on a clear day. It is by far the best photo spot on the beach and yet I’ve never bumped into another person taking photos or just taking in the view when I’ve made the climb. Perhaps it is a bit of a secret…but I’m sharing it with you because, like the food at the Don CeSar, it’s not to be missed. 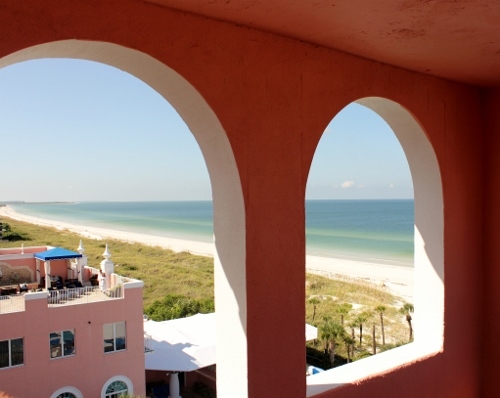 Sea Porch is located inside the Don Cesar Hotel, 3400 Gulf Blvd., St. Pete Beach, Florida. 727.360.1881. 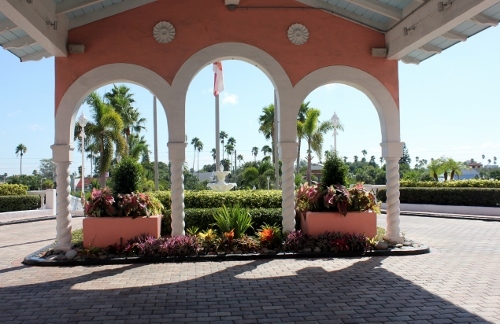 Parking is available in the resort’s parking area as well as nearby metered on-street parking. Eat With: Minimal caution. 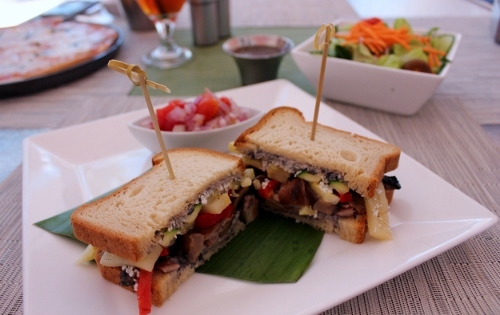 The staff at Sea Porch are exceptionally well informed and took great care making sure my meals were prepared within my dietary restrictions. Full Disclosure: I contacted the Don Cesar prior to my breakfast visit to ask a few questions about their menu. I let them know I was visiting to write about their gluten-free dining options. To my surprise, we were graciously treated to breakfast compliments of the resort. On return visits for lunch and cocktails, I paid the tab. All opinions expressed are my own, as always. It is an amazing place, Shirley! 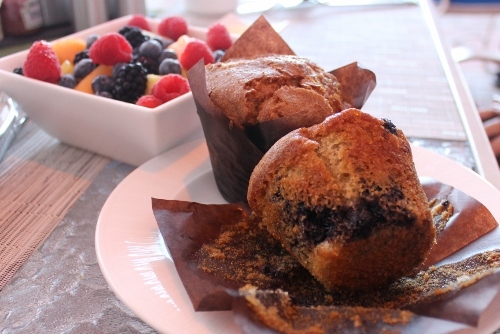 It would be a fabulous place for a retreat for gluten-free food lovers. I’m convinced they would be great hosts! 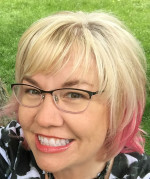 A truly Grand Pink Lady!